It’s time for @twitter to confirm a real name and real person behind every account, and for @facebook to to get far more stringent on the same. I don’t care what the user name is. But there needs to be a single human behind every individual account . He’s wrong about the real name, because anyone familiar with the topic of “real” names knows perfectly well that they make online problems worse rather than better. He’s right about the real person though. Let me use a specific and prosaic example to explain why this is and to suggest a much better solution to the bot problem. The example is internet dating, a topic on which I am a media commentator. Or at least I was once. A few years ago, I appeared on a programme about internet dating on one of the more obscure satellite TV channels. They wanted an “internet expert” to comment on the topic and since no-one else would do it, eventually the TV company called me. I agreed immediately and set off for, if memory serves, somewhere off the M4 in West London. The show turned out to be pretty interesting. I didn’t have much to say (I was there to comment on internet security, which no-one really cares about), and I can’t remember much of what was said, but I do remember very clearly that the psychologist at the heart of the show made a couple of predictions. While interviewing a couple who had met online, she said (and I am paraphrasing greatly through the imperfect prism of my memory) that in the future people would think that choosing a partner when drunk in bar is the most ludicrous way of finding a soulmate, and that internet dating was a better mechanism for selecting partners for life. Now it seems that this prediction is being confirmed by the data, as the MIT Technology Review reports that “marriages created in a society with online dating tend to be stronger”. The psychologist’s other prediction was that internet dating gave women a much wider range of potential mates to choose from and allowed them to review them in more detail before developing relationships. Of course, internet dating also increases the size of the pool for men, but think that her thesis was that men don’t seem to make as much use of this as women do. Anyway, the general point about the wider pool now seems to be showing up in the data, assuming that interracial marriages are a reasonable proxy for the pool size. When researchers from the National Academy of Sciences looked at statistics from 1967 to 2013, they found “spikes” in interracial marriages that coincided with the launch of online matchmaking sites. Why am I telling you all this? Well, it’s to make the point is that internet dating is mainstream and that is it having a measurable impact on society. This is why it is such a good use case at the sharp end of digital identity. It is rife with fraud, it is a test case for issues around anonymity and pseudonymity, it is a mass market for identity providers and it is a better test of scale for an identity solution than logging on to do taxes once every year. Now, I am not the only person who thinks this and there are already companies exploring solutions. And you can see why they want to: online dating is a huge business. A third of the top 15 iOS apps (by revenue) were dating apps. I don’t think this is a solution, because if I were to be on an internet dating site, I would want the choice of whether to share my name, or Twitter identity, or anything else with a potential partner. I certainly would not want to log in with my “real” name or anything information that might identify me. In fact, this is an interesting example of a market that does not need “real” names at all. “Real” names don’t fix any problem. Your “real” name is not an identifier, it is just an attribute and it’s only one of elements that would need to be collected to ascertain the identity of the corresponding real-world legal entity anyway. Frankly, presenting “real” names will actually make identity problems worse rather than better since the real name is essentially nobody’s business and is not necessary in order to engage in the kinds of transactions that are being discussed here. Forcing the use of real names will mean harassment, abuse and perhaps even worse. What internet dating needs, and what will solve Mark Cuban’s social media problem as well, is the ability to determine whether you are a person or a bot (remember, in the famous case of the Ashley Madison hack, it turned out that almost all of the women on the site were actually bots). On Twitter it’s not quite that bad yet, because there are still many people posting there, but with bot networks of 500,000 machines tweeting and re-tweeting it is not in good shape. The way forward is surely not for Twitter to try and figure out who is a bot and whether they should be banned (after all, there are plenty of good bots out there) but Twitter to give customers the choice. Why can’t I tell Twitter that I don’t want bot followers, that I want a warning if an account I follow is a bot, that I don’t want to see posts that originated from bots that I don’t follow and so on. Just as with internet dating, the problem is not real names but real people. Now, working out whether I am a person or not is a difficult problem if you are going to go by reverse Turing tests or Captchas. It’s much easier to ask someone else who already knows whether I’m a bot or not. My bank, for example. So, when I go to sign up for internet dating site, then instead of the dating site trying to work out whether I’m real or not, the dating site can bounce me to my bank (where I can be strongly authenticated using existing infrastructure) and then the bank can send back a token that says “yes this person is real and one of my customers”. It won’t say which customer, of course, because that’s none of the dating site’s business and when the dating site gets hacked it won’t have any customer names or addresses: only tokens. This resolves the Cuban paradox: now you can set your preferences against bots if you want to, but the identity of individuals is protected. One of my acid tests of whether a digital identity infrastructure is fit for the modern world is whether it can offer this kind of strong pseudonymity (that is, pseudonyms capable of supporting reputations). If we can construct an infrastructure that works for the world of internet dating, then it can work for cryptocurrency, cars, children and all sorts of other things we want to manage securely in our new always-on environment. We have to fix this problem, and soon, because in the connected world, if you don’t know who IS_A_PERSON and who IS_A_DOG and who is neither, you cannot interact online in a functional way. The G4S World Cash Report came out and I was e-leafing through it when it struck me once again just how much Germany is an outlier when it comes to retail payments. The average German wallet contains 103 physical euros, the European Central Bank (ECB) estimated last year, more than three times the figure in France. Bloomberg says that cash is used in 80% of German point-of-sale (POS) transactions, compared with only 45 percent—and falling fast—next door in the Netherlands. I think they must mean 80% by value because the FT says that 48% of retail transactions are in cash (down from 58% a decade ago). Perhaps it is that Germans are just naturally conservative people. The Roman historian Tacitus (55-117CE) wrote in his history “Germany and its Tribes” that the barbarian inhabitants of that land had traditionally exchanged weapons, slaves, cattle, women and such like to settle up between themselves but that the Romans had introduced them to money. Having changed their medium of exchange once in the last two millennia, perhaps they just don’t want more change for change’s sake. Or perhaps there is another explanation. The use of cash in retail is falling slowly and we all know that Germans prefer to keep some of their money as cash at home rather than in the bank, maybe much of the cash “in circulation” there just isn’t. Given the suspicion that much of the cash in Germany is stuffed under mattresses rather than circulation in the economy, it was still rather surprising to hear from the Bundesbank that nine in ten of the euro banknotes that they are are never used in transactions. That’s right: nine in ten. Approximately all of the cash printed in Germany is never used. Not rarely, not occasionally, but never. So this led me wonder whether this huge volume of never used banknotes are in “hoards” (that is, legitimate money held outside of the banking system) or in “stashes” (that is, illegitimate money held outside of the banking system). Can it really be that the German predilection for holding some of their money in the form of cash account for these billions of euros in inert paper money? Well, because of the current unusual circumstances with respect to interest rates and so forth, it’s certainly a plausible hypothesis. The European Central Bank (ECB) interest rate for bank deposits is currently minus 0.4%. Conventional economic theory would predict that at a minus rate, depositors would prefer to hold cash rather than pay the banking system to look after their money for them. Now, it clearly costs something to manage cash over and above the cost of managing an electronic deposit hence it is interesting to speculate what the German “crossover” negative interest rate might be, the modern version of the old “specie point” at which it was cheaper to hold bullion for monetary purposes rather than paper instruments. The current negative interest rate cost German banks about a quarter of a billion euros per annum. The Bavarian Savings Bank Association sent around a circular to their members some time ago setting out their calculation of the crossover rate, which they calculated as something like -0.2%, or half of the current negative rate. However, as I wrote at the time, this isn’t really a serious calculation because, as it says at the end, it doesn’t take into account the significant costs of cash in transit (CIT) or the additional security expenditure that would be needed to guard cash hoards. But it does make a fun point, at least to me, which is that the existence of the €500 notes has an impact on that crossover rate. Now that the ECB has decided stop printing the 500s, banks will have to store masses of 200s, so the cost of storage and transport will be higher (which, in turn, will put a premium on the 500s in circulation so that they will trade above par). Just as an indication, two billion euros in 200 euro notes weighs about 11 tonnes. While that calculation may not be complete, it does make the interesting point that although we have passed the crossover point already, no banks have to date decided to store their squillions under the mattress rather than leave them on deposit. It seems to me therefore that Bavarian estimates must be too low and that the costs of transport, security, insurance and so on are actually quite high, so the ECB will be able to push interest rates further negative before it gets close to a genuine crossover point that would see banks investing in larger mattresses. Talking about central banks and digital / crypto / virtual (* delete where applicable) currency, I was interested to read (in the Russia Today Business News) of an initiative to create a joint digital currency for BRIC countries and the Eurasian Economic Union (EEU) that has been proposed by the Central Bank of Russia, according to its First Deputy Governor Olga Skorobogatova. She is reported as saying that “The introduction of a national digital currency seems to us not entirely justified from the point of view of macroeconomics” (presumably because as Russia is still quite cash-intensive the costs might not be justified and the benefits too concentrated). I can see why the alternative suggestion of a cross-border digital currency set up between trading partners would have much wider benefits. This is not a new idea. As I discussed in my book “Before Babylon, Beyond Bitcoin“, some years ago the then-Chancellor John Major proposed a similar concept as an alternative to the euro which at the time was labelled the hard ECU (and ignored). The hard ECU would have circulated alongside existing national currencies. It would be used by businesses and tourists. It would never exist in physical form but still be legal tender (put to one side what that actually means) in all EU member states. Thus, businesses could keep accounts in hard ECUs and trade them cross-border with minimal transaction costs, tourists could have hard ECU payment cards that they could use through the Union and so on. But each state would continue with its own national currency — you would still be able to use Sterling notes and coins and Sterling-denominated cheques and cards — and the cost of replacing them would have been saved. Thus, businesses could keep accounts in hard ECUs and trade them cross-border with minimal transaction costs, tourists could have hard ECU payment cards that they could use through the Union and so on. But each state would continue with its own national currency — you would still be able to use Sterling notes and coins and Sterling-denominated cards — and the cost of replacing them would have been saved. The idea of an electronic currency union to facilitate international trade has new resonance. While Bitcoin captures the media attention, there are a great many other possibilities: new community currencies, brand-based plays, commodity baskets and goodness knows what else. All of these make it an exciting time to be in the electronic money business, but they also make it unpredictable, which is why it is fun. As I say in the book, we’re not looking at a world in which some kind of new global currency takes over, but a world in which a great many communities choose the currencies that are most efficient for themselves. At it happens, one of those communities could be the European Community! Noted political theorist Marine le Pen herself has said that she could see the EU setting up another currency “like the ECU”. I’m sympathetic, obviously, because the idea of restoring the Franc while simultaneously creating a new pan-European currency makes economic sense. If anything, however, Ms. le Pen’s proposal is not really that radical. Why have nation-state control over money at all? Why not allow regions to have their own currencies? Why not use Normandy Money? Why not have pan-national currencies? Or Islamic e-Dinars? I’m on the same page as “The Futurist Magazine” here. In September 2012, as part of a compilation of pieces about life in 2100, they said that it is quite likely that we will still have money in 2100, but it may not be issued solely by nation states. I couldn’t agree more. Madame First Deputy Governor Skorobogatova is, incidentally, far from alone in wondering about new digital currencies at this level. Christine Lagarde, head of the International Monetary Fund (IMF), gave a talk on “Central Banking and Fintech” in September last year in which she said that digital currencies (of the kind proposed by Madame Deputy First Governor) could actually become more stable than fiat currencies. She says that they could be issued against “a stable basket of currencies” ( a hard SDR?) but I would extend that suggestion to a token based on a basket of commodities (or, indeed, a mixture of both) or some other “root” with long-term stability. It’s one thing to have crackpot technologists such as me talking about augmenting and perhaps even replacing national currencies, but when people who are actually in charge of money start speculating about the same, then you do have to suspect that some things are about to change. As I explained to the Financial Services Club in London recently, I have a theory that while Bitcoin isn’t the future of money, tokens might well be. In case you are interested, here’s the deck I presented to them: it’s in three parts, first of all a high-level explanation of what tokens are, then a discussion about using tokens to implement money and finally a model to help facilitate discussion around these topics. Of course, I’m not the only one who thinks that the financial services mainstream should be developing their token strategies. At Money2020 Asia in Singapore I had the privilege of interviewing Jonathan Larsen, Corporate Venture Capital Manager at Ping An and CEO of their Global Voyager Fund (which has a $billion or so under management). Jonathan has already forgotten more than I will ever know about financial markets and as he is also Chief Innovation Officer at Ping An (and a very nice guy too), I take his views very seriously. When I put to him that the tokenisation of assets will be a revolution, he said that “tokenisation is a really massive trend… a much bigger story than cryptocurrencies, initial coin offerings (ICOs), and even blockchain”. He went on to say that he had no doubt about the potential for tokenisation to “reduce friction across every asset class and to create fractionalization of assets where it does not exist today”. In fact, and I paraphrase only slightly here, he said that when the token market is properly regulated and the technology is stable then everything will be tokenised. Why do people like Jonathan (as opposed to techno-deterministic utopians such as myself) think that tokens are such a big deal? I think it’s because tokens are the first viable implementation of the 1990s dream of digital bearer instruments with the “code is law” (sort of) management infrastructure. They allow for the exchange of assets in an auto-DvP (delivery versus payment) mode with no clearing or settlement which means for efficient, liquid markets. Now, one of the first steps towards a regulated token market has come the Swiss regulators (who are important because of the Zug “crypto valley” that has become the home of many token plays). The regulator there, FINMA, has developed an approach based on the underlying purpose of the tokens that are created. FINMA categorises tokens into three types: Payment tokens (ie, money), Utility tokens (tokens which are intended to provide digital access to an application or service) and Asset tokens (which represent assets such as stakes in companies or an entitlement to dividends). Of course, hybrid forms are possible and in practice there are likely to be a few different configurations. 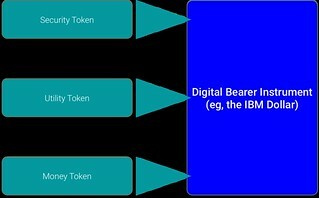 One good way to think about this, I think, is to think in terms of combinations of these token types as a means to implement the “digital bearer instrument” (DBI) that has long been seen as the basis of the post-internet, post-crypto financial marketplace. This is a realistic vision of the future. DBIs as a synthetic instrument comprising regulated tokens, DBI trading that operates without clearing and settlement on shared ledgers and shared ledgers with ambient accountability to create marketplaces that are not only more efficient but better for society as a whole. I touched on this in my talk at the FS Club but then went on to focus on the specific implications for digital money, as it is interesting to speculate what digital money created this way might look like. We might, for example, imagine that for tokens to be used as money in the mass market they should be much less volatile than cryptocurrencies have been to date. Hence the notion of “stablecoins” that are linked to something off-ledger. An example of this category is the “Saga” coin (SGA). SGA has some pretty heavyweight backers, including Jacob Frenkel, chairman of JPMorgan Chase International, Nobel prize winner Myron Scholes and Emin Gün Sirer, co-director at the Initiative for Cryptocurrencies and Smart Contracts at Cornell University, so it deserves a look. This is a non-anonymous payment token that is backed by a variable fractional reserve anchored in the IMF’s special drawing right (SDR) basket of currencies which, as the FT pointed out, is heavily weighted in US dollars. These reserves will be deposited with regulated banks through algorithms in the underlying smart contract system. It seems to me that initiatives such as Saga are more representative of the future of money than cryptocurrencies such as Bitcoin, but even they represent only part of the spectrum of possibilities that will extend across many forms of tokens. As I wrote last year, in “Bitcoin isn’t the future of money, but tokens might well be”, tokens won’t only be issued by companies, of course. It seems to me that tokens that implement the values of communities (and, because they are “smart”, can enforce them) may come to dominate the transactional space (think of the Islamic e-Dinar and the London Groat). I was as alarmed as I am sure all of you were to read a story in Computing telling how EMV cards could be cloned with malware. Now, as you might imagine, were this to be true it would be a matter of the highest priority in the world of card issuers. 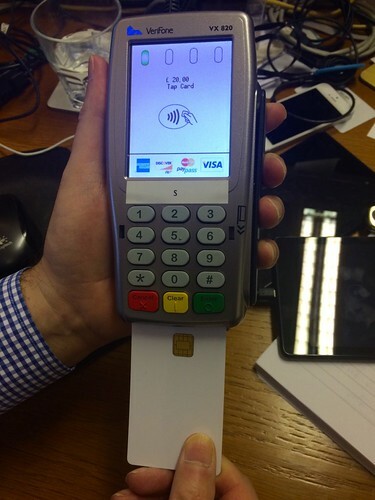 If EMV cards could be cloned (spoiler alert: they can’t) then the whole world of payment cards would collapse. Since my I spend some of my time in that world, yet hadn’t heard anything about this catastrophic turn of events, I was naturally curious as to the accuracy of the report. Delving further into the “news” story, I found the interesting qualification that the fake cards work “on virtually any Brazilian POS system”. Brazilian POS systems? What? Ah, wait… Now I know that they are talking about. Sadly, this yonks old hack won’t work in most places any more. But it does work in a few remaining places, and Brazil is one of them. Why? Well because Latin America, an early adopter of EMV, is still heavily reliant on “static data authentication chips”, which allow the criminals exploiting them to create usable new chip cards with the data that they can extract. Thus problem isn’t that “EMV cards” can be cloned. They can’t. The problem is the use of Static Data Authentication (SDA) in EMV. We all knew about this many years ago. In fact, although lots of people knew about this, at the time we thought it would have been irresponsible to blog about it, so I put it to one side until stimulated by an enquiry from Brazil, I finally wrote about it back in 2014, explaining in detail what the problem was, how it was fixed and why it was no longer a worry. Many years ago, when my colleague at Consult Hyperion were testing SDA cards in the UK, we used to make our own EMV cards. To do this, we essentially we took valid card data and loaded it onto our own Java cards. 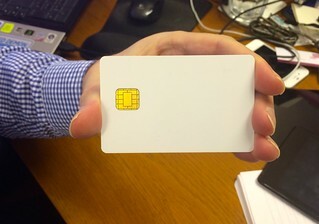 These are what we in the business call “white plastic”, because they are a white plastic card with a chip on it but otherwise completely blank. Since our white plastic do-it-yourself EMV cards could not generate the correct cryptogram (because you can’t get the necessary key out of the chip on the real card, which is why you can’t make clones of EMV cards), we just set the cryptogram value to be “SDA ANTICS” or whatever (in hex). This is what the criminals referred to in the story are doing. Now, if the card issuer is checking the cryptograms properly, they will spot the invalid cryptogram and reject the transaction. But if they are not checking the cryptograms, then the transaction will go through. You might call these cards pseudo-clones. They act like clones in that they work correctly in the terminals, but they are not real clones because they don’t have the right keys inside them. Naturally, if you make one of these pseudo-clones, you don’t want to be bothered with PIN management so you make it into what is called a “yes card” – instead of programming the chip to check that the correct PIN is entered, you programme it to respond “yes” to whatever PIN is entered. We used these pseudo-clone cards in a number of shops in Guildford as part of our testing processes to make sure that issuers were checking the cryptograms properly. Not once did any of the Guildford shopkeepers bat an eyelid about us putting these strange blank white cards into their terminals. But I heard a different story from a Brazilian contact. He discovered that a Brazilian bank was issuing SDA cards and he wanted to find out whether the bank was actually checking cryptograms properly (they weren’t). In order to determine this he made a white plastic pseudo-clone card and went into a shop to try it out. When he put the completely white card into the terminal, the Brazilian shopkeeper stopped him and asked him what he was doing and what this completely blank white card was, clearly suspecting some misbehaviour. The guy, thinking quickly, told him that it was one of the new Apple credit cards! “Cool” said the shopkeeper, “How can I get one?”.